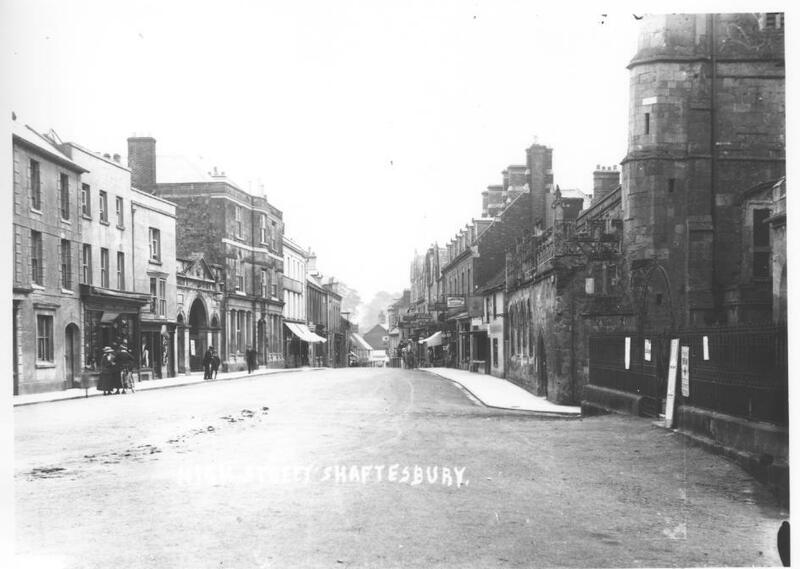 In the early 20th century Shaftesbury was mainly a municipal borough and agricultural market town where produce, especially cheese and butter from the local area was traded. Saturday was Market Day, and the Market House, which ran from Bell Street to the High Street, was over 80 metres long. One of the entrances is now part of the Arts Centre, and the High Street entrance, now demolished, stood on the left-hand side of Lloyd’s Bank. Cattle were driven down the High Street to the market every week, and pigs were transported in netted milk carts so they could not escape. Farmers tied their cows to rails in the old cattle market, where the supermarket car park in Bell Street is now, and there could be up to a hundred horse- drawn vehicles in the town, bringing in farmers and their produce. The sale ring was in the centre of the cattle market, and John Jeffreys, the auctioneer, advertised sales regularly in the Western Gazette. There were three big fairs each year, in spring, August and November, for trading sheep, cattle, cheese and other agricultural products; they offered entertainment as well. St Martin’s Fair was the largest annual fair and apart from the usual animal and produce stalls, coconut shies, swing-boats and a steam roundabout were set up outside St Peter’s Church and the Town Hall. Shaftesbury Agricultural Society Horse Show was held each October, and was one of the most important such shows in the west of England. In November the annual Chrysanthemum and Poultry Show was held in the Market House. There was a wide range of shops and services available in Shaftesbury to cater for residents and all the local villages. The police station was in Bell Street where the library is now, and in 1911, Superintendent William Bowles had a sergeant and ten constables at his disposal. The police station provided cells, and accommodation for some of the policemen, including the superintendent. Superintendent Hussey took over in 1913, seconded from Dorchester. Courts were held weekly in Shaftesbury or Gillingham, and there were 20 county magistrates available to attend the petty sessions held at the Town Hall. The County Court was held once a month, again in the Town Hall, except in September. Public facilities included gas street lighting which served the top of the town, with oil lamps in St James and Enmore Green. Water was pumped from a large well on Barton Hill to a reservoir near the Semley Road, and distributed by gravity to most of the houses in the town. However the supply was turned off between 6pm and 8am, which caused some inconvenience for householders without a cistern. Most people in St James drew water from public taps. A few residents had telephones, mainly businesses and wealthy private individuals. The fire engine station was in Bell Street, and was staffed by the captain, William Farris, a lieutenant and twelve men. Before the war, the ‘engine’ was in fact a horse-drawn hand pump. The horses used to pull it were kept in a field in Enmore Green, and time was unavoidably wasted as efforts were made to catch the horses and harness them to the pump. In a town with so many thatched houses this was a serious problem. The corporation swimming baths were on Barton Hill, and tickets could be purchased at the Town Hall. Men and women bathed separately. Open spaces were provided for public use, such as Park Walk, Castle Hill and the newly completed Pine Walk. There was a comprehensive postal service in the town, with mail dispatched several times a day, and up to four daily deliveries and one on Sundays. The main post office in the Commons was open from 8am to 9pm on weekdays, and there were sub-post offices in St James and Enmore Green. Postmen walked to Fontmell Magna, Stour Row, Margaret Marsh, Semley and other villages, and often rested in a hut at the end of their round, so they could collect letters on their way back to town. Two banks served the town, the Wilts and Dorset Banking Company Ltd on the High Street (now part of Lloyd’s Bank), and the National Provincial Bank of England in the Commons (now the Natwest), as well as the Post Office Savings Bank. Public transport catered for those without their own carts, or people arriving at Semley by train. An omnibus ran to Semley station from the Grosvenor Hotel several times a day to meet most of the trains, and many of the Shaftesbury pubs hired out carriers for goods, especially on Saturdays, market day. 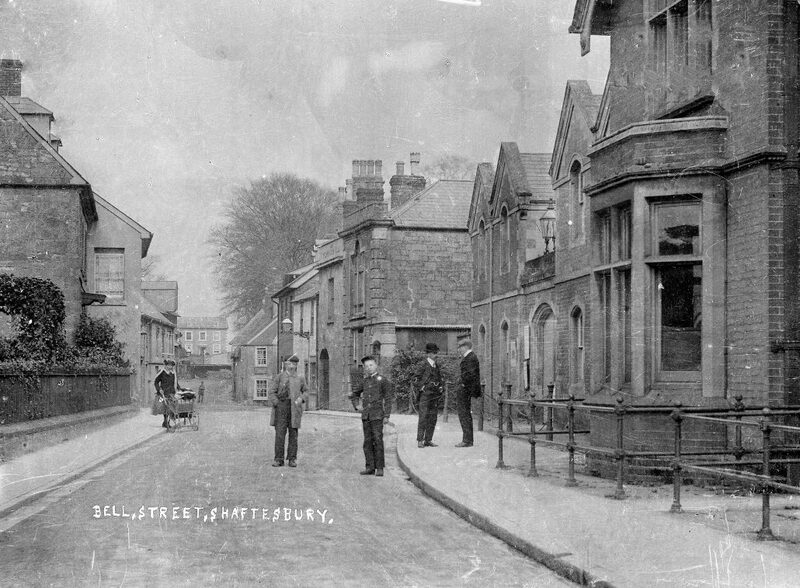 Shaftesbury was a popular destination for cyclists, and there were several agents for bicycles in town, and a cyclists’ ‘hotel’ in Salisbury Street. The first cars began appearing in the early 20th century, and this change in vehicles resulted in better surfacing for roads. Until this time roads had been dusty in summer and muddy in winter. In summer the council paid for roads to be sprinkled with water to keep the dust down. Roads were surfaced with stones, which were broken by workmen with hammers, and then crushed flat with a steam roller, preceded by a man waving a red flag. Piles of stones were left around the town so repairs could be made as needed. In 1911 Shaftesbury Grammar School catered for seventy boys, twenty five of whom were boarders. There were three elementary schools, one in Bimport for about 320 children, one in St James and the third in Enmore Green. Cann also had an elementary school, which was outside the town boundary. The Girls High School accepted day girls and boarders and like the Grammar School, had a very good reputation. There were three Church of England churches in Shaftesbury: Holy Trinity, St Peter’s (dilapidated and rarely used), and St James. Holy Trinity and St Peter’s were combined; the Reverend Frederick Ehlvers had been rector for the two churches since 1885. The rector at St James was the Reverend George Yarnall. Holy Trinity Church was very large, seating over 850 parishioners. 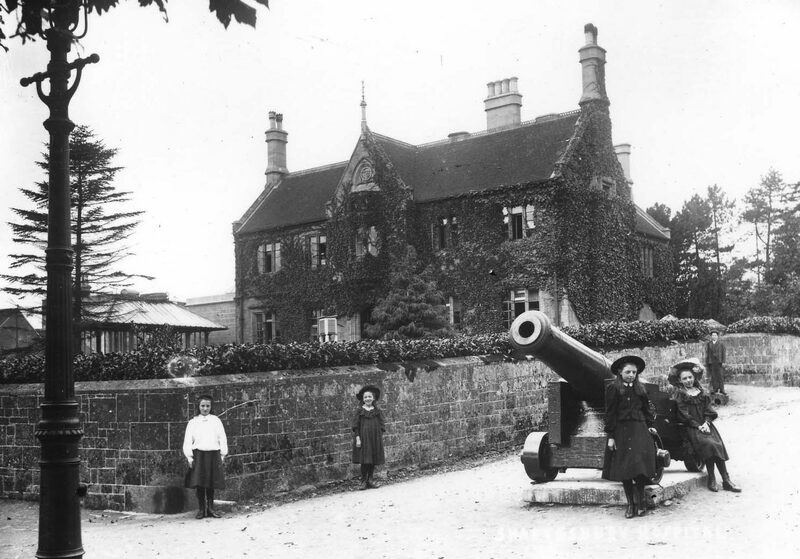 The Roman Catholic Church in Salisbury Street was built in 1910, and since 1902, French priests had been living at Belmont House, now the Royal Chase Hotel, escaping persecution in their native country. 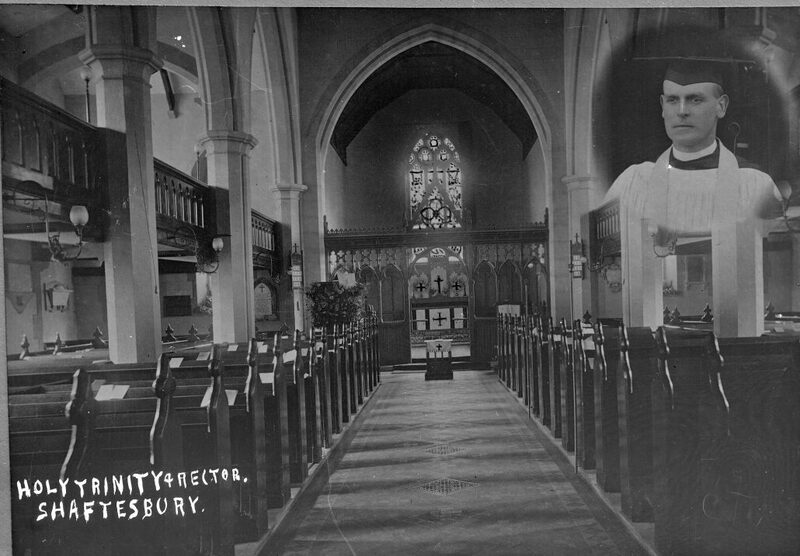 There has long been a strong non-conformist tradition in Shaftesbury, reflected in other places used for worship: the Quakers at the Institute on Gold Hill; the Congregational chapel; the Wesleyan Methodist chapel rebuilt in 1907; the Primitive Methodist chapel in St James; and the Brethrens’ meeting house in Salisbury Street. There was also a temperance hall in Bell Street with seating for 500. The Literary Institute in Bleke Street was established in 1852, and by 1911 had over 200 members, and 100 lady subscribers. The facilities included a library of over 4,500 books, newspapers and a billiard room. The Working Men’s Institute was on the ground floor of the parish centre which was built at the top of Gold Hill in 1910-11(now St Peter’s Hall), with the Quakers meeting on the first floor. The 4th Battalion Dorsetshire Regiment had its armoury at 35 Bell St, and was presided over by Captain Freame, a colour sergeant, and a drill instructor. The main industrial employer was John Farris, whose engineering works employed about 80 men, and was situated on the corner of Bleke Street and Victoria Street, where Homefarris is now. 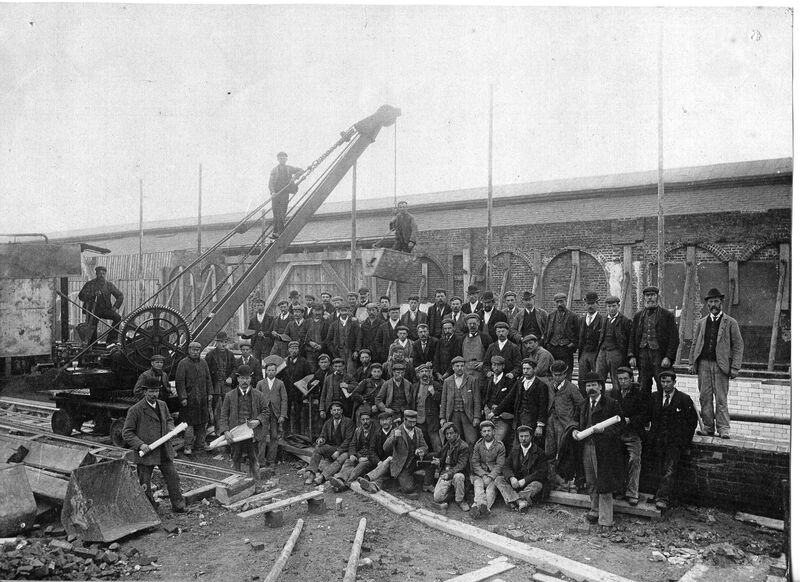 There was also a mineral water works in Barton Hill, and the Shaftesbury Gas and Coke Company in Bimport. Shorts Coach Works stood on the site of the current post office on Angel Square, and around this time was adapting to servicing the needs of motor cars as well as doing more traditional work on horse drawn vehicles. Glove-making and leather work gave employment to women, who either worked at home or in the town in workshops. The Westminster Memorial Hospital had 12 beds in total in 6 wards, and also provided accommodation for nurses, a convalescent room, and a bed for emergencies and accidents. An operating theatre was added in 1907, the gift of Lady Theodora Guest. 126 in-patients were treated in 1906. In 1909, central heating was installed in the operating theatre and wards, but the hospital’s funds were running low. The Shaftesbury Carnival Committee was founded to provide financial support to the hospital. In 1912 the committee was able to hand over more than £130. The carnival was suspended in 1915, and only restarted after the war. Dr William Harris was in overall charge of the hospital, and remained so throughout the Great War. 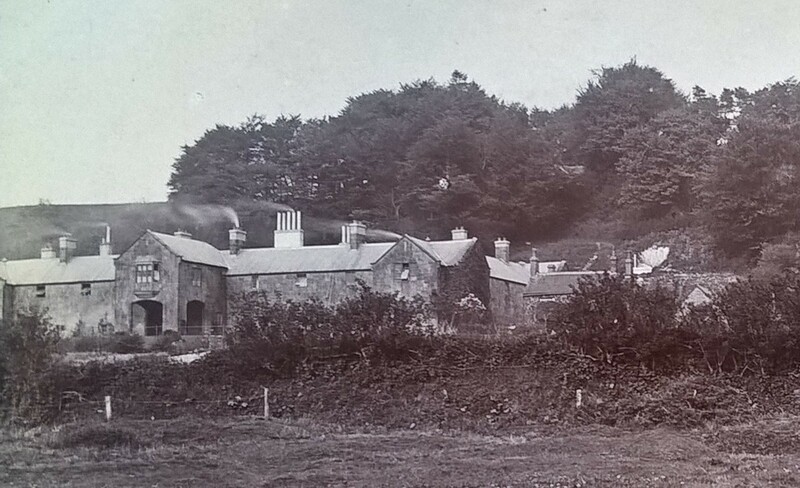 The workhouse, formerly in Umber’s Hill, catered for the Shaftesbury Union, comprising the town and twenty-one villages, a population of 12,783 in 1911. It had places for one hundred inmates. In 1911 it had seven staff members, and ninety-five residents, which included forty-one people over sixty years of age, and twenty-five children. 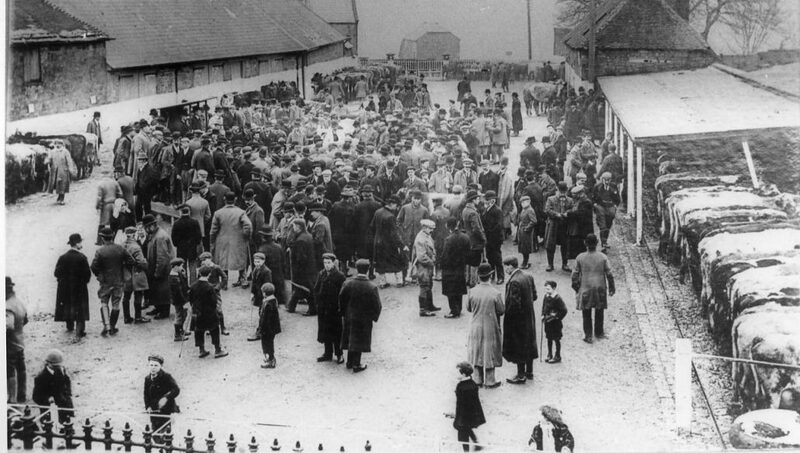 The inmates were well cared for, and reports were published every month in the Western Gazette, giving details of condition checks and special events, and asking for tenders for various goods and services. Westminster Memorial Hospital, Shaftesbury 1871-1971, a short history, published by the Salisbury Group Hospital Management Committee and the Shaftesbury and District Historical Society.